Manchester City host Cardiff City on Wednesday night with the chance to move to the top of the Premier League table. The Cityzens are two points behind Liverpool with a game in hand. However, Pep Guardiola’s side will face the Bluebirds without star striker Sergio Aguero. The Argentine was removed on Saturday during Manchester City’s 2-0 win over Fulham having asked to be taken off. Aguero lasted 57 minutes at Craven Cottage before being removed. The Manchester City striker found the back of the net against Fulham to push his goals total to 19 this season. Aguero has not trained since Manchester City returned from London. In his pre-match press conference for Wednesday night, Guardiola claimed the striker could feature against Brighton in the FA Cup semifinal. 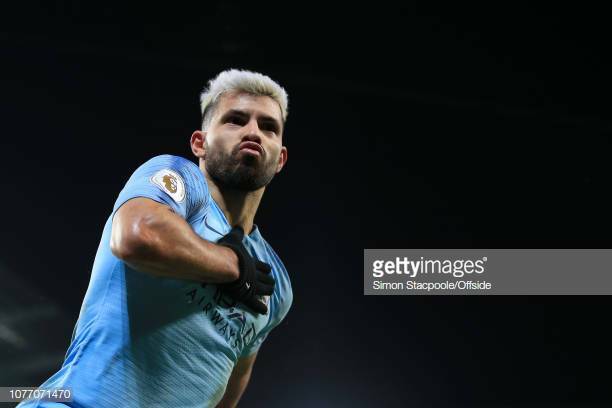 According to the manager, they will need to monitor Aguero this week before a decision is made. Fabian Delph is also sidelined by injury heading into the midweek clash with Cardiff City. Manchester City will have the likes of Benjamin Mendy, Vincent Kompany, Fernandinho, and Kevin De Bruyne available for Cardiff City’s visit. Each has been suffering from their own respective injuries in recent weeks. Can Manchester City go back to the top of the league? Guardiola’s team will go into Wednesday night’s match full of confidence. Manchester City have beaten Cardiff City in three of their last four games in all competitions. Cardiff City’s only victory during that time span came all the way back in 2013 in the Premier League. The Bluebirds won 3-2 at home on the day. Since then, Manchester City have won three straight games in all competitions outscoring Cardiff City 11-2. In their previous meeting this season, Manchester City thumped the Bluebirds 5-0. Aguero, Bernardo Silva, Ilkay Gundogan, and Riyad Mahrez were all on target for the Cityzens.